Protect your baby's tender cheeks from rough shoulder strap webbing in strollers and car seats, with these easy-to-make covers. Just cut two 5" (13cm ) squares for a baby under 6 months from quilted fabric, acrylic fleece or Sherpa fabric. For an older child cut a 5" by 8" (13cm by 20 cm) rectangle. Bind with bias tape, or serge around all edges. 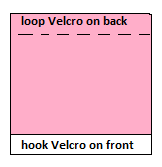 Sew a strip of hook Velcro® down one edge, and loop Velcro® on the opposite edge (and side) of fabric. Or hammer-in a row of three snaps. Fold one cover over each shoulder strap, and fasten Velcro® or snaps. Shalan Bate posted: As a certified child restraint safety tech: I highly advise against putting aftermarket covers on your car seat. 2. it is not even tested with the seat. So no idea how it would work in a collision. 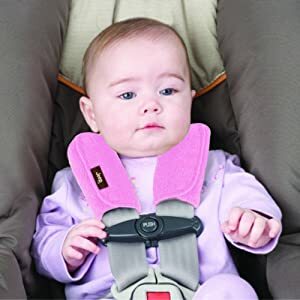 Most seats come with covers, but if you find the harness is bothering baby's neck, the best bet is to snug the shirt up some, so it is between neck and straps.